For weeks I avoided picking it up, even as her lovely face stared me down from its cover, from the spot on my nightstand I had placed it as a reminder that I should read this book and be amazed by the courage of its heroine. But I was scared to; there was part of me that was convinced if I examined and related to her story my own fate would mirror hers and I would die an early death just like she did. It is foolish and irrational to think this way; one can certainly miss out on an abundance of spiritual treasures by avoiding what is difficult or unpleasant. It was due to my respect for her family, her friends, her legacy, that I was finally able to get over myself and meet intimately, through her journal entries and website postings, an extraordinary and humble and beautiful and wise individual who met Christ as He is (rather than how we assume He should be) through suffering. 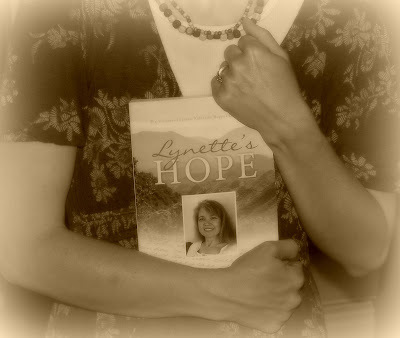 Lynette’s Hope is the title. It was edited and compiled by her dear friend, Father Luke Veronis, and published by Conciliar Press. This memoir of sorts is like a window into a soul being purified by fire. Lynette Hoppe, a mom to two young children, a devoted wife, and a missionary to Albania was not above us in her capacity to feel fear, pain, or disappointment and because of that her emotions and inner wrestlings cut straight to the core of my being in a way that hypothetical ponderings can never quite. If any scenario has the ability to shake up my beliefs, it is that of a mother being taken from her still very dependent loved ones. While reading in first person the thoughts of a woman living out and coming to terms with my greatest of worries, I was touched profoundly and even permanently altered by the words and sentiments she eloquently left behind as a gift to all of us who want so badly to be convinced that Christ is really and truly able to carry us through the roughest of storms and into the quiet of calmness and everlasting safety. I know it is tempting, wrote Lynette in the Fall of 2005, for people to think that their prayers are not being answered because I have not been healed of cancer. But the truth is that prayers are being answered in the most miraculous of ways – perhaps not for healing of body, but certainly for healing of soul. I know that it is tempting for myself to think only in terms of physical and material prosperity when it comes to deliverance and wellness - that being blessed means being happy and comfortable. Oh the sadness and the guilt that I encounter when faced with news of someone in the throes of a wearisome situation. That could be me! I selfishly internalize, Why wasn’t it me? I can’t imagine being struck by such sorrow! Lord have mercy, make it stop; that is too much of a burden for me, I mean for anyone, to carry! What I learned through Lynette’s experience, however, is that within the intensity of such pain and utter dependence upon God there is unearthly clarity for those who are willing to view their trials as a means to salvation, as opposed to a form of punishment or grotesque unfairness. As the peripherals in Lynette’s life were made obsolete by her increasing lack of energy and spiritual awareness, her revelations became ever more momentous and remarkable. After months of serenity and an illogical type of joy, Lynette fell prey to despair and my own spirit sank as she recounted her anxiousness at hearing nothing but the echo of her desperate prayers against the hollowness of newly acquired doubts. An existential angst, she wrote, gripped me, something foreign to me, as I have never struggled with God’s existence. God has always been real to me, and so to face the question of his existence now seemed to me a kind of failure, a sign that here, at the end, I would fall from faith. Why, I wondered, would God appear to distance Himself after all of her efforts to stay loyal, to remain a witness to His mercy in the midst of a monumental struggle? I wanted to be assured that in such a state of torment Heaven would override the horror of having to leave behind a sweet and wanted life and forcibly dull the sharpness of a soul being sheared of its body. Lynette fasted; she stopped trying and began waiting on Christ. During this time, Lynette remembered, I started to feel that it wasn’t right for me to pray for my own healing, but at the time I so desperately wanted to be healed. I felt that all my prayers were motivated strictly by the desire to gain favor in the sight of God so that he would heal me. My sincerity in prayer sputtered like a wet candle wick. Eventually, Lynette would understand that the darkness gripping her so tightly was an outward attack and not a collapse from within. Father Veronis would bring to light for her the “Blessed are the Poor in Spirit” beatitude and she would be comforted. The image that came to my own mind when reading this passage about an already crippled yet godly individual becoming still more broken and then refined, was that of a house that when one first enters appears neat and tidy and perfect, especially when compared to a neighbor’s trashed bungalow with the clutter and the junk and the rusted out cars in the driveway; how simple it is to look around town for a bigger mess than your own and be satisfied. Yet the inherent isolation of dying removed completely from Lynette the option of escaping the dust and debris in her own life through busyness and voyeurism. The all-encompassing magnitude of her cancer became a spotlight uncovering grime and soot she never knew existed within the previously unexplored crevices of her character. Oh my, I suddenly realized, God was not letting Lynette down, He was allowing her to be cleansed out of love; He was preparing her for her entrance into His Kingdom. When I first got the news of my pending departure, I was frantic, thinking I needed to do some kind of “ministry,” but I soon realized that there was no value in ministry at this point. What I have done until now is what I have done. What I have become is what I am. To try to have some kind of dramatically different prayer life is simply an attempt to “win his favor” and would actually be rather artificial. I am allowing myself to simply relax in the love of Jesus, to enjoy him in a new way, to think about joining him soon. I have so much peace in thinking there is nothing I can do to win over Christ. All I can do is throw myself into his arms and know that it is only through the work of Christ that I can be saved. I feel that I am ready to die a “painless, blameless, and peaceful death” even as we pray every liturgy. I may have a lot of physical pain, but in spirit I feel no pain, other than leaving those I love. How fortunate we are to have access to such precious and honest reflections from a warrior, a marathon runner for Christ. May her refusal to give up on either herself or her Creator continue to affect my everyday choices and personal meditations. Dear Lynette, I want to thank you for sharing your voyage with those of us still longing to make sense of it all. I pray for the continued mending of those who were closest to you and that your memory will indeed be eternal! Twice a week, now, I throw four children, a blanket, cleats, and two small gloves in our mini-van and drive a couple of miles to Dogwood Park for a ninety-minute T-ball game. In April, this seemed like a great idea. Six-year-old Priscilla and five-year-old Benjamin could play on the same team together. The warming weather with all of its out of doors potential was practically begging to host bike rides, long leisurely strolls, and sporting events. But a “next month” adventure seems a whole lot more feasible without the reality of today’s logistics to exhaust you and make you ultimately second-guess a seemingly super decision. Thus is my thinking every Wednesday and Friday afternoon while I am single-handedly rallying my troops to get out of the house in a timely manner, while searching desperately through clothes hampers and cluttered closets for a missing green tube sock, or while trying to pep talk my two-year-old into whining a little bit less once we get to the field and lay out our gear for an hour-and-half of confinement. And that’s nothing compared to the nerve fraying aspects of the six-inning, non-score keeping, showdown between our team and the their team, itself. “Stand–up Ben!” I yell again and again and again, “Keep your glove on, buddy!” But he does neither, choosing rather to make “dirt angels” by lying flat on his back in the outfield while flapping all four of his limbs simultaneously. 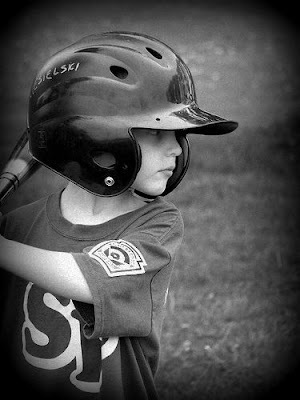 His coach is exceedingly patient, lifting him gently by the shoulders and then placing him in the proper fielding position – legs bent, hands on knees, eyes on the batter. For less than a minute Ben stays focused before playfully nudging his younger teammate who in turn nudges him back until both of them are laughing and then full-on wrestling while the ball passes by unnoticed and I burn with embarrassment. The two other moms I sit with are sweet and empathetic, “He’s adorable,” they assure me as the three of us watch their own sons strike the fiercest of batting stances and not pick up gravel to sprinkle over their heads, which is the activity Benjamin has moved onto since I pulled him aside to firmly remind him about keeping his hands to himself. Priscilla, in the meantime, is soaking up praises for being a surprisingly sufficient ball handler. “Way to hustle Prissy!” yells coach and she beams. “That a girl!” I echo, “Good catch!” I don’t mean to wish that only she was representing our family on the Fox Photography Little League team but ashamedly that is exactly what I pine for as time drags on unmercifully and Ben becomes ever more sidetracked by his instinctively silly impulses. I assume by now he cares little about this game or the opinions of anyone watching it and so I turn my attention to his sister who cares obviously a great deal about both. After the final inning’s conclusion, Priscilla makes a beeline toward my lap; she’d like to hear in more detail about how proud I am to be the mother of such a t-ball aficionado. It is then I notice Benjamin and the telltale quivering of his lower lip. “What happened?” I ask alarmed. “Are you hurt?” And I find out then that he is, that he is heart-broken by my silence. Because I had nothing, not one single positive thing to say about his own outlandish performance my distinctively vibrant wildflower was wilting. Assumptions, I discovered, can be deceiving. I found the following quote by Philo of Alexandria on Father Stephen Freeman’s excellent and thought provoking Glory to God For All Things blogsite: Be kind, for everyone you meet is fighting a great battle. Meaning, of course, that your curt and surly neighbor may be suffering through a divorce, an illness, or a stubborn wave of depression. We all have hidden baggage that can weigh down the best of intentions – we all disappoint at one time or another. And yet my memory is often shortsighted when it comes to the raising of children who lose their tempers, their manners, their library books. How quickly I forget my own deficiencies. “Be still!” I demand of a wired little boy whose veins pump electricity through his sparkly squirmy body. “You are kidding me!” I mutter disdainfully within earshot of his daydreaming older brother who has misplaced the pair of sandals I intended for him to wear all through the summer, which is spiteful of me, really, since I was much less hard on myself when I broke my cell phone, then replaced it, only to promptly leave the new one somewhere secret and mysterious. “Where do you think it is?” asks my obviously confused husband. “I’ll come across it,” I assure him unconvincingly. I was greeted yesterday morning by three different news stories on my e-mail homepage: there was the hot off the presses report of a buxom, racily clad pop singer who had secretly wed an R& B musician and now they are still insanely rich, like before, but also married; a little further down was a piece about the passing of 98-year-old Irene Sendler, a former Polish social worker who had risked her life in the early 1940’s, enduring torture and arrest, to save 2,500 Jewish children from Nazi death camps by sneaking them out of a Warsaw ghetto and giving them false identities; finally, next to recently emerging photos and statistics, was an update on the earthquake in China that buried thousands of adults and children under the twisted steel and crumbled concrete of collapsed buildings. Within just a few seconds, as my eyes scanned spastically from one account to the next, I felt annoyed, inspired, and horrified. I heard loudly and simultaneously three opposing messages impossible to either separate or make sense of as a whole: Be distracted. Be motivated. Be anxious. I’ll tell you the truth, I am miserable when segmented, when I jolt through my days in a series of whiplash-like stops and starts – now materially ambitious, resentfully claustrophobic, or steely with determination to exude love then whoosh in a heartbeat, dumbfounded by the potential of sorrow and shivering with a sense of foreboding. When my trust rises and falls with the tide of current events, I lose joy and my Orthodox perspective. Comfortable. Bored. Optimistic. Jealous. Empathetic. Insecure. Remorseful. 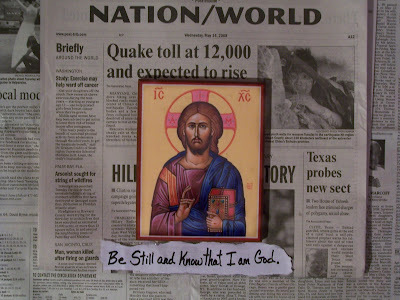 Like a roller coaster ride is my identity if I choose subtly, by way of unconscious knee jerk reactions, to forget God. I am thankful for where I came from and I am humbled by the dedication of those within my former faith community who serve with graciousness and selflessness their enemies and neighbors, but the issues prompting my exodus were not so inconsequential as, or limited to, the simple need for a change of scenery. What I traded in everything for was a broader and less culturally relevant worldview, a get out from behind the microscope and marvel at the hugeness of it all, kind of difference. Please forgive me for politely disagreeing with the assumption that assurance, devotion, and understanding can be conjured forth from out biased and imperfect minds. I nearly rendered my faith impotent by trying to neatly stitch together a sort of logical and consistent pattern out of suffering, grace, and difficult scriptural passages that defied being pinned down or summarized, at least not without changing the rules a bit (Too abstract for your taste? Try switching your tune from literal to symbolic). I wrestled with loose ends and became tongue-tied making excuses for what seemed to be faulty and even sometimes cruel craftsmanship. I got all knotted up in my own and what appeared to be, at least from a human standpoint, God’s inconsistencies. Weekly lectures and worship songs were not enough to override a belief that ebbed and flowed with my fears and ability, or lack thereof, to stay focused on feel good ponderings. It was the sacraments in the Orthodox Church, with their Christ instigated power to transcend my fickle reasoning that finally permeated my skittish spirit with indefinable confidence. Founded on spiritual experience and not being a part of rationalism and scholasticism, wrote Hieromonk Hilarion Alfeyev in “The Mystery of Faith: An Introduction to Orthodox Dogma and Spirituality," Orthodox theology is a living entity in our day no less than hundreds of years ago. The same questions have always confronted the human person: What is truth? What is the meaning of life? How can one find joy and peace of heart? What is the way to salvation? Christianity does not aim to dot all the ‘i’s by answering all the questions the human spirit has to ask. But it does open up another reality which transcends all that surrounds us in this earthly life. Once this reality is encountered, the human person leaves behind all his questions and bewilderment, because his soul has come into contact with the Divinity and falls silent in the presence of the Mystery which no human word can convey. Yes, yes, yes and Amen. He’d been picking at his food and not sleeping. I had never before seen this side of my usually stoic husband and it unnerved me. Troy was fighting a personal battle, one I couldn’t solve with hugs or good advice. There was a time when he and I both would have speculated on what exactly had gone wrong or what steps we could take to more speedily gain freedom from this trial. But now our default reaction was just to be, to accept this challenge in front us knowing only that God is good and that every encounter with disappointment and injustice is a chance to be purified of our stubborn and egocentric passions. Troy’s endurance and courageous choice to use this opportunity as a means for growth had a rippling effect, arousing in me, a mere bystander to his pain, a resolve to pare down the many distractions that keep me anchored to a limited field of vision. Stillness and patience are at serious risk of extinction in a world that chooses to remain ignorant by way of busyness and theorizing. It is instinctive to become flustered by the side effects of mortality, to start to panic and lose our hope in the face of tragedy. But in a crisis, our feelings and preferences are mere hotbeds for rash decision making and so we cry, as Orthodox Christians, only “Lord have mercy!” We sob with those who are grieving just as Jesus wept and mourned at the tomb of Lazarus, acknowledging loss and sadness within the context of the Resurrection - offering not explanations but calmness and a firm foundation of peace amidst uncertainty. In the summer of 2002, I co-hosted a shower for one of my very dearest friends in the whole wide world. I wanted, of course, for the party to be perfect and packed to the gills with the fondest of memories, memories I would capture through the magic of film and then display in a scrapbook-y kind of album, gluing photos on to rattle patterned cardstock and writing something adorable like “Mommy-to-be” or “Waiting for the Stork to Arrive” with curly cue letters in the space beneath them. Those were the old days, when picture taking was a dicey affair -when you aimed, shot, and then hoped for the best, crossing your fingers all the way to Walgreens, CVS, or wherever it was that you dropped off your undeveloped memoirs from a time or place of great personal significance. Surely, then, you can imagine my disappointment upon paying the fifteen dollars for larger 4x6 prints, and doubles, only to sort through image after image of folded arms, laps cradling pastel blue paper plates, crossed legs, sandaled feet and a dozen or so completely noggin-less torsos. “Say ‘baby’ (instead of “cheese” because I’m clever like that), I had instructed all of the guests obediently posing, not realizing that with each and every click I was lowering my neck and the camera with it, offing heads like the Queen of Hearts, herself. Not a one was worth salvaging and I was forced to concede that I would most likely never become a noted photographer. 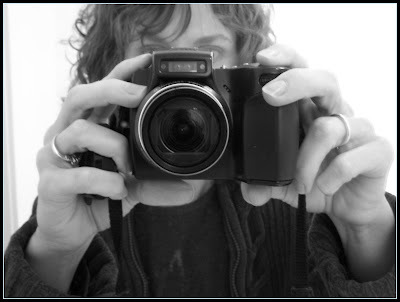 It's slim pickins around here in the picture department due to those subsequent years of depending on the kindness of friends and family members to provide us with their extra set of photos. “Please,” long-distance relatives would beg of me, “do you have anything recent you could send?” And I’d promise that I would try to be more reliable – like I promised myself I would exercise and stop eating sugar. It’s a great idea in theory, for those who know how to stay on task, but …hmmm…wait a minute…what was I talking about? Fast forward to just a couple of weeks ago when I borrowed my parent’s digital camera to take portraits of our sleepy-faced family before the midnight Pascha service, and by borrow I mean fell completely in love with, so much so that they haven’t had the heart to ask for it back. I was beyond pleased with the results. For the very first time EVER we got a picture of the six of us looking simultaneously pleasant – no tears, no half closed eyes, no wagging tongues. This mercifully foolproof technological wonder automatically focuses, let’s you know when you to need use flash, allows you see the shots you’ve just taken and then to either delete them or store them or print them out on an impossibly tiny printer that conveniently attaches to the battery charger. If you’re in nature, press the flower button for close-ups of petals or of rain drops hanging precariously from wispy branches. At t-ball games, choose the symbol of a man sprinting to catch clearly the expression on your son's face as he rounds the bases. There is even an option for novices like myself to be used for taking “action photos of children in bright light” which I gratefully took advantage of while the kids were swimming. By relying on established settings put in place by seasoned experts, I am free to stop sweating the details (too much shade? not enough?) and get down to the business of immortalizing the ages and stages of our lives that might otherwise pass me by near impercetibly. I realized in my late twenties, once the novelty of unchecked independence had become tiring, overwhelming, and tainted by anxiety, that I function better - much, much better inside the safety net and comfort zone of set boundaries. At first I felt resistant to what I assumed were stifling barriers within full-time employment, and then stay-at-home motherhood, and even within the Church, the Orthodox Church for which I had abandoned an un-liturgical and less demanding Christ-centered tradition to become a part of. I thought it was better, more all-American, to decide for myself when to come, when to go, how to pass the time, and the best, most personally fulfilling way to live out the Faith. But the erraticism of my frequent mind and taste changing proved to be a stumbling block. Instead of feasting on the goodness of love and productivity, I was starving. In all the busyness of ransacking books, trends, and popular opinions for some kind of direction - for the most perfect ever recipe for contentment, I had failed to pause and nourish myself with something solid, healthy, and consistent. I pray the ancient prayers of the Church and attend the scheduled services; I read the Scriptures assigned in a lectionary - the same Scriptures that were interpreted over a thousand years ago by Church Fathers whose Holy Spirit infused wisdom formed the rock solid, non-negotiables of Christian theology. I clean the exact same mess in my kitchen at least five times a day. I am governed by the sacraments, mundane responsibilities, and the needs of others dependent upon me for warmth and sustenance and unconditional support. I have willingly traded enslavement to my finicky whims and desires for the freedom that comes with submitting to the already established guidelines for salvation, guidelines defended valiantly throughout history by saints and martyrs. Outside of myself lies the key to authentic liberation, the mysterious solution to a pandemic of despair plaguing the rich and the poor, the old and the young, the sick and the seemingly strong and healthy. "If anyone would come after me, says Jesus in of the book of St. Matthew, he must deny himself and take up his cross and follow me. For whoever wants to save his life will lose it, but whoever loses his life for me will find it." How simple. How dangerous. How maddeningly accurate! “Will someone, anyone, please take that thing from my mother!” Elijah pleaded with his friends at the bus stop, while I stalked him paparazzi style with my zoom lens. But I simply can't help myself, it's literally everywhere - the gorgeousness of spring blooming fragrantly on Dogwood trees, cheerily in the singing of whippoorwills, nostalgically in the youthfulness of my two sons and two daughters whose days I am now chronicling with renewed zeal. By intentionally searching for beauty in places often overlooked I’ve been rewarded with the gratification of regularly beholding its presence, of devouring the holiness right in front of me. You can hear audio versions of these posts at my Close to Home podcast site on Ancient Faith Radio! Click HERE to give it a try! Click on the image above to view my profile on the Orthodox Speakers Bureau website! What is Orthodoxy? Come and See! 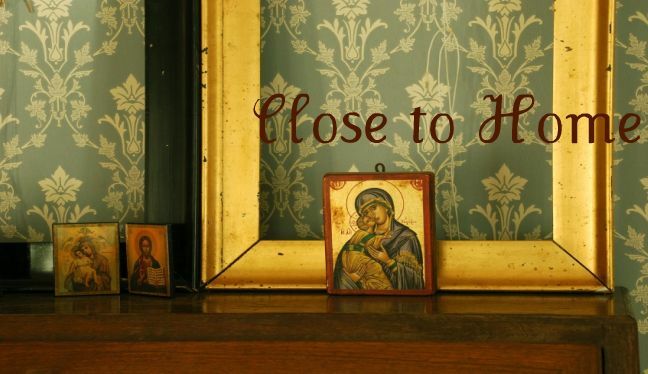 "Close to Home," the book!